Early experiments with amplifying string vibrations date to the 1910s, but it wasn't until the 1930s that the first electric guitar made an appearance. Our electric guitar history lesson starts there. Those early experiments involved telephone transmitters being adapted and placed inside violins and banjos to amplify them. And in the 1920s, carbon button microphones were attached to the bridge on stringed instruments, but the resultant signal was weak. Still, with so many hobbyists on the case, it was only a matter of time before there was a break-through. According to electric guitar history, that's widely believed to have been made by George Beauchamp of the National Guitar Corporation, who designed an electrically amplified guitar in 1932, along with National colleague, Paul Barth. Another National employee, Harry Watson, designed a one-piece maple prototype in the shape of a frying pan and later that year, Beauchamp, Barth and Adolf Rickenbacker formed a partnership to build the cast aluminium frying pan. Two years later, they named themselves the Rickenbacker Electro Stringed Instrument Company. By that time the likes of Dobro, National, AudioVox, Epiphone, and Vega were producing electric guitars, and in 1935 they were joined by Gibson. The first solid body wooden guitars were made around 1934. 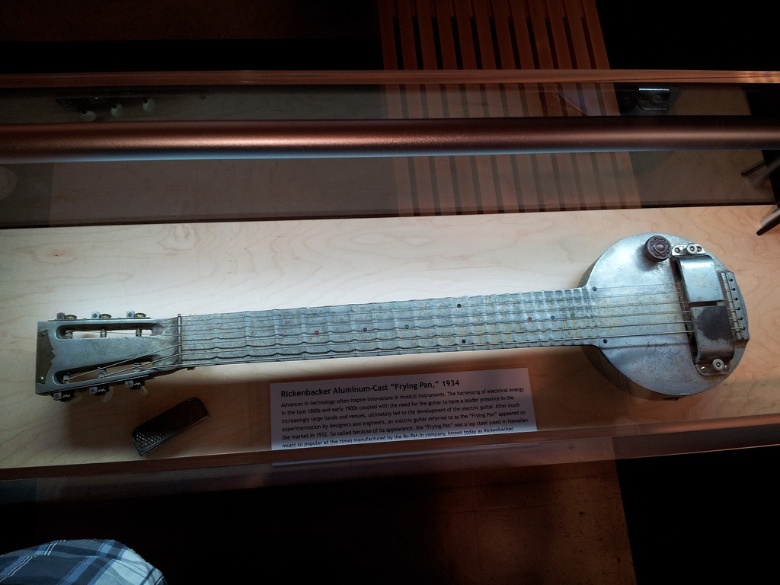 And the first documented performance with an electric guitar was made by Gage Brewer in 1932 with an Electric Hawaiian A-25 lap steel frying pan-style guitar, as well as a standard Electric Spanish made by Beauchamp. Gibson produced a hollow-body electric guitar, the ES (Electric Spanish)-150 in 1936 – the '150' reflected its price when bundled with an amplifier. It featured one single coil pick-up. In 1940, Les Paul built his 'log guitar' from an Epiphone acoustic archtop, and while it took a long while for him to persuade Gibson that he had something worth pursuing, it eventually saw the light and between them the designed, made and launched the first Gibson Les Paul solid body electric guitar in 1952. While Gibson and Les Paul were working on their design, Leo Fender was putting the final touches to his Telecaster, which launched in 1950, followed by the Stratocaster in 1954.